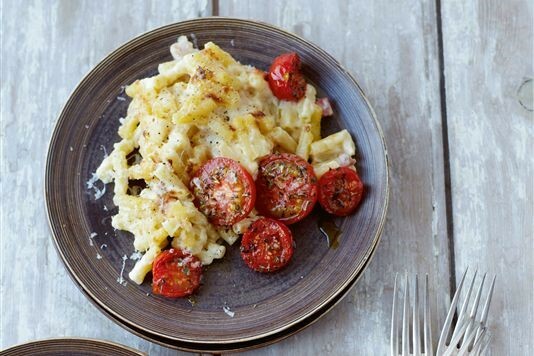 A good rich, flavoursome macaroni cheese is a simple but welcome treat on a winter's evening. Heat the olive oil and butter in a saucepan. Add the onion and pancetta and cook over a medium heat for 10 minutes. Sprinkle on the flour and stir to combine. Add the milk and stir over a low heat until you have a smooth sauce. Spoon in the crème fraiche and cream and simmer gently, uncovered, for 10 minutes. Remove from the heat and stir in both cheeses. Cook the macaroni according to the packet instructions. Drain, then lay the macaroni in a gratin dish. Spoon the sauce over the macaroni and put the dish under a hot grill for a few minutes until golden and bubbling. Serve with the grilled tomatoes. To prepare the grilled tomatoes: lay the sliced tomatoes in a gratin dish. Sprinkle with the oregano and olive oil, season with salt and pepper, then place under the grill for 10 minutes.